Posted on 1/22/2019, 9:14 am, by rackycoo, under General Projects. 2 Brrrr. It’s so cold where I am that all I can think of is snow. One thing I love about these projects, though; they’re not cold at all. Each has all the beauty of a snowflake, without the threat of frostbite. 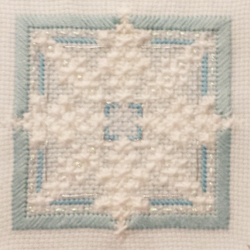 Smeddley embroidered this beautiful single snowflake in whites and cool blues. Framed, it makes a lovely accent in a cozy room. 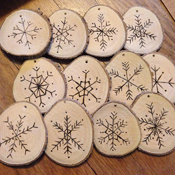 These woodburned ornaments by ceemonster are like actual snowflakes, in that no two are alike. Don’t you love a festive banner? 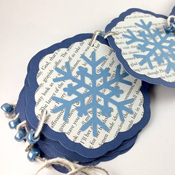 This one’s made with pages from a Harry Potter book, so it’s got a hint of magic to it. Mistress Jennie cut all the pieces, including the snowflakes, on her Silhouette. 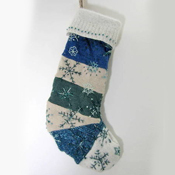 This snowflake stocking was made with wool sweaters. Acadian Driftwood stitched the sweaters together and then hand embroidered the snowflakes. Just lovely! 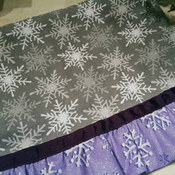 TheMistressT found a couple of coordinating snowflake fabrics and created a fun winter hand towel. It’s perfect for the season! Is it cold where you are? If so, bundle up and stay warm. And make something! Snow days are perfect craft days.